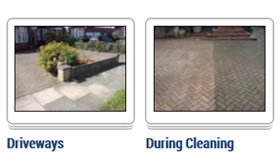 The Drive Cleaner cleans driveways, re-sands block paving, and applies sealants to driveway surfaces. We clean a variety of driveways, including tarmac, concrete and block pavement. Regular cleaning helps maintain and prolong the life of your driveway. This will save you money in the future on premature replacement costs. At The Drive Cleaner, we don’t use chemicals in our cleaning process; this ensures that the surrounding lawn, plants and flowers are not at risk. Of course, this applies to pets and children as well! Our professional equipment is designed to clean driveways safely, thoroughly and without damage to surfaces. Our experts will remove stains and any moss or algae from your driveway surface, which can be slippery and unsafe, as well as unsightly. Attachments and expert techniques reduce the splashing that sometimes occurs with driveway maintenance. The driveway is one of the first impressions visitors will have of your property. 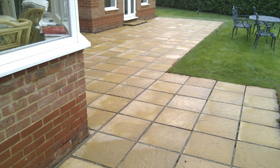 By cleaning and maintaining this surface, it will look years younger, and show off the property to its best advantage. This can add thousands to the value of your home or commercial property. The Drive Cleaner’s driveway cleaning services are comprehensive. We start by removing debris, loose dirt and leaves. We use special brushes for this, with the exception of large weeds, which are removed by hand. For cleaning, we use the latest rotary pressure technology. This equipment safely cleans driveways without damaging the surface. For block paving, we offer re-sanding services, as well as the application of a sealant to protect the longevity of the surface further. At The Drive Cleaner, we offer regular cleaning packages and one-time services, depending on your needs and preferences. For additional questions or to schedule cleaning, please contact The Drive Cleaner.